Today will be my last post for a few days. It was our last full day in Kauai. We don't leave until tomorrow night but we have to check out in the afternoon so there won't be time for posting tomorrow. All of Hawaii has been under a "Vog" today. That's a fog that covers all the islands that comes from a volcano. It's been kind of a miserable day - dark, cloudy and foggy. But we have had such great weather the rest of the time that we can't complain. There are birds EVERYWHERE here in Kauai. Roosters roam around all over the place and little birds just flock all over. Every morning when we eat breakfast - these birds all wait nearby and as soon as someone leaves their table - they swarm it. (Laurie - this is for you) (She would FREAK OUT here - she's so scared of birds). We went back down to Hideaway beach today and took a picnic lunch. This is me coming back up the trail. We have seen a lot of weddings this time and last time - but it normally consists of around 10 people including the bride and groom. There is a HUGE wedding (for Hawaii) going on tomorrow. There have to be 50-60 people here who are all here for the wedding. They are from CA (we have been eavesdropping at the pool - it's hard to miss them all). The bride has to have around 10 bridesmaids (can you imagine being asked to be in this wedding? Take out a loan). They were putting up this huge tent today on the beach. We thought it was for the wedding - until I heard them talking and found out this was just for the rehearsal dinner BBQ. They have had a band down there playing tonight in the tent. I'm a little sad we will be leaving before I get to see this wedding. ha! Tonight - Scott and I drove to the south part of the island for our last dinner. I've been wanting to eat at Tidepools. We heard it was so nice and we were not let down. It's at the Hyatt in Poipu and it's this really neat restaurant made up of thatched roof huts. Very romantic and the food was really good. The Hyatt was beautiful. We walked around after dinner. We were so impressed with how friendly EVERYONE was there. Up until tonight - pretty much everyone we met who worked in Kauai have been EXTREMELY rude. We almost felt like we had southern hospitality tonight. Scott got Sea bass and I got some kind of Hawaiian fish. They were very very good!!!! 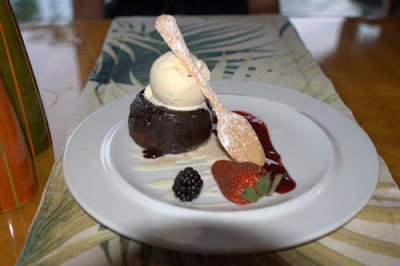 I think we have had chocolate lava cake at every restaurant - it seems to be the dessert of choice! SOOOOOO good! We have had a wonderful trip but we are kind of ready to go home. We miss our dog so much! WE made some videos of him before we left and we have been watching them. Isn't that pitiful? I don't think we will ever be able to leave our children and go on vacation. ha! I will miss seeing pictures of your swimsuit coverups and cute dresses. But I'm glad you'll be home soon - and I hope y'all have a great flight! I'll be praying for a safe trip back. Coming home is the best and the worst part--getting readjusted to reality is always hard for me. But I love being back in my own bed with my own "stuff"!! Your trip was AMAZING!! I had fun watching you have fun!! I know exactly what you mean about missing your dog. When we went to Miami for our honeymoon, I was ready to go home. I missed my dog sooo much! I pray you have a safe trip home. As soon as I saw all those birds on the table I thought of LO. Now I doubt she'll ever go to Hawaii! I hate that your trip is up but I do miss e-mailing you all day every day so I'm glad you're coming back! Although, you have been great at e-mailing and blogging while you've been away! Good job! TIDEPOOLS---we LOVE that place!!! It is such a neat atmosphere! I'm glad you've had a great trip...I'm praying for a safe trip back to AR! I have to ask - where do you get your cute coverups?? The boyfriend and I are going to Jamaica next month, and I can't seem to find coverups I like for the beach. Yours seem perfect, though! I hope you guys have a great last day. Those birds on the table = WOAH!! That orange dress is so cute!!! Relish in your last few hours there. Enjoy and relax! I'll pray for a safe, hassle-free trip home for you! I LOVE the black dress. It is so cute. I'm glad you had a wonderful time!! I'm so sad to hear people have been so rude there...it doesn't even sound like they were a "little rude" but VERY RUDE...and that is a bummer. That ruins a trip for me. It has been fun seeing Hawaii through your eyes. Thanks. Love the picture of you coming up the stairs from the beach. TOO CUTE! Glad y'all's last full day was a good one! Y'all have a safe trip back--I know you Dawson will be as happy to see you two as you'll be to see him!! I guess I would have to eat breakfast in the room. I would be miserable out there. I would totally want to crash that wedding! With all your cute clothes, I bet they would totally think you are a friend of the bride. I'm sad your vacation is coming to an end. I've enjoyed all your post & have felt like I was on vacation with you...except not. I love that you took videos of your dog! We are about to leave our pup for a week and it is killing me...I will have to take some pics for sure. Praying you have a safe trip back! This was my first visit to your blog and I enjoyed it so much! My husband and I went to Kauai a few years ago and visited some, but not all, of the places you visited. I loved looking at your pictures and reminiscing. I also loved looking at all of your super cute outfits. Have a safe trip home! Awesome! Thanks for sharing. Love all of your "trouseau!" We're a world away but enjoy 'sharing your vaca." Too cute. I have loved each and every post from Hawaii! I almost felt like I was there! I can't get over that huge wedding... can you imagine?!?! Anyway, I hope your trip home is safe! I know you'll miss Hawaii, but I also know that you will be glad to be back home! Now I'm ready to go to Hawaii! I'm so glad you've enjoyed your trip. I'll be praying for your safe travel home. Girl, I am soooo glad you have had such a great trip!! I'm like you, I would have wanted to stay and watch the wedding, too! It was so much fun reading your blog about your trip. I am amazed at how quick it went by. I have enjoyed reading your blog.